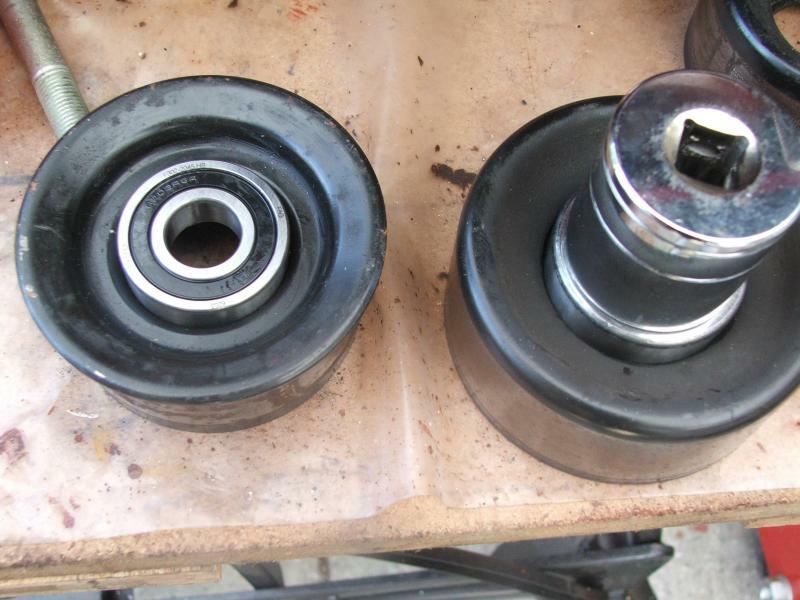 The factory pulley is smooth, and this replacement is grooved. Also, the description mentions that, due to Jaguar's design changes (?? ), you must use a new tensioner and mounting bracket for the pictured idler. Anyone had experience replacing the factory (smooth) idler with one like above? I should probably stand down as I mentioned as I am not equipped with either my car for a visual, or the manual at this moment, but your link referred to the accessory belt idler, not the supercharger belt idler. I was able to find OEM replacements at my local auto parts store. When they brought it in, it was in a Jaguar box... but about half the price of the dealer's quote. BTW... the dealer gave me the one you are looking at, which was definitely wrong. The dealer's parts guy insisted it was correct, so I started looking elsewhere. JWT - Quite right, the listing refers to the part as the "accessory belt idler." But the description claims it's for the supercharger idler ... and neither pulley is slotted on my car, anyways. Just can't find any listing anywhere for the smooth, OE pulley. Leaning towards buying a used assembly I found on eBay. There are equivalent Gates idler pulleys available that seem interchangeable. The smooth ones can cause an annoying squeak when cold until the belt warms up on them. You could also swap just the bearing inside, can't remember the size, but these are standard ones, just a couple of bucks. Just swap out the bearings!!! My fix costs about £2.50 - Use a big socket to knock the new bearings into the pullies, I think from memory it's 1-1/4" - Part numbers included in the pictures below. the *** 6203.2RSR fits accessory belt idler/tensioner and tensioner for S/C. 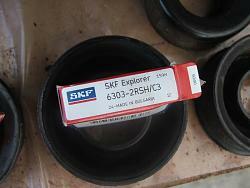 The SKF 6303-2RSH/C3 fits S/C idler, once off the car it's obvious. 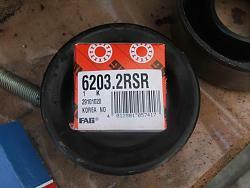 to do all 4 pulleys order 1xSKF 6303-2RSH/C3 and 3xFAG 6203.2RSR. Last edited by Sean B; 07-05-2012 at 01:57 PM. Sean, that is great info on the idlers. If I run into that issue again, I will employ your method. Yeah, very cool Sean. I found a used one on eBay, but if it has any play, too, I'll try your method. Thumbs up on the bearing replacement. Just don't reinstall the pulley backwards... quiet easy to do. Thanks for adding the bill of materials! 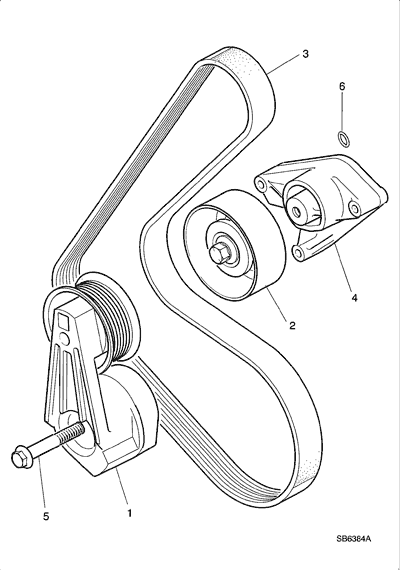 The pulley retaining bolt on the accessory drive tensioner is left hand thread. This helps in avoiding loosening during running because the pulley turns CCW during normal operation. This can be inferred from the caution in JTIS to avoid turning the bolt CW during de-tensioning when a wrench is applied to the bolt. The question then, is whether the pulley retaining bolt on the supercharger tensioner is also left hand thread since there is no similar caution in JTIS given that the de-tensioning is handled using the 1/2 square drive hole. This pulley also turns CCW in relation to the bolt head since the bolt head is on the back face of the tensioner. Total cost of 4 bearings was under $20 in NTN brand. All 4 existing bearings are toast. The new bearings are in a plastic container in the freezer, and the steel pulleys will go in the oven at 250F for a couple of hours. With luck, the bearings may drop in without pressing as has been the case for some others doing this job on other makes with the same bearings and similar pulley construction. Last edited by plums; 09-09-2013 at 10:32 PM. Thanks, that was very useful in terms of avoiding additional expense for pulley replacement. However I discovered a lack of understanding meant I struggled to find the correct bearings at first (the first shop I tried was out of stock of the part number I quoted and I didn't know if the suggested replacements were suitable). The first 4 digits are important for bearing size and type, don't mix them up or get them wrong. 6203 will not go where you need a 6303 bearing. The 6 or first digit is the type or style of bearing. If you need a 6 you need a 6. The second digit is the "robustness" of the bearing, but as far as I can tell, also correlates to a difference in size. You cannot use a 62xx bearing instead of a 63xx bearing for example. The 3rd and 4th digits relate to the bore size. Size 03 means 17mm. Then it looks complicated but not if you ignore most of it. Important is to look for "C3" in the suffix when necessary. It means a slightly higher than normal clearance within bearing, important for applications where bearing is cold on startup but gets hot for example drive belt components in engine bay. Normal clearance usually has no designation or sometimes the letters "CN". Less than normal is "C2". There are others. Important in this case is normal or "C3". Don't use normal if "C3" is specified - abruptly shorter lifespan or seized bearing is a possible risk. Using "C3" instead of normal is probably ok but I say that based on a best guess from reading various bearing related information, not because I have any sort of mechanical knowledge or experience. A bearing salesman I talked to this week said for bearings size 6203 and 6303, it doesn't generally matter whether you use "C3" or "normal" because they are relatively small bearings. I'll play it safe and stick to "C3" for all 4 drive belt related bearings on my jalopy. I'll possibly buy "normal" also (they're cheap enough) and ask the mechanic to have a look when the old parts come off. Most of the other suffix information relates to seals, clips, etc but is manufacturer specific. For example 2RS1 or 2RSH means double rubber seal for SKF bearings, but *** use code 2RSR, NSK use code DDU, NTN use code LLN, etc for double rubber seal. Look for either digit "2" or double letter combination e.g. "LL" instead of "L" to indicate double not single seal. That's my guess, not official information. For these Jaguar X308 drive and supercharger belt pulley bearings you need double rubber seal not single since they are exposed to the elements. Other non-rubber type seals might be ok I don't know but I suspect they won't last as long. It's easy and cheap to get the correct double rubber seal bearings so do that. 1xSKF 6303-2RSH/C3 = 6303 double rubber seal C3 clearance. 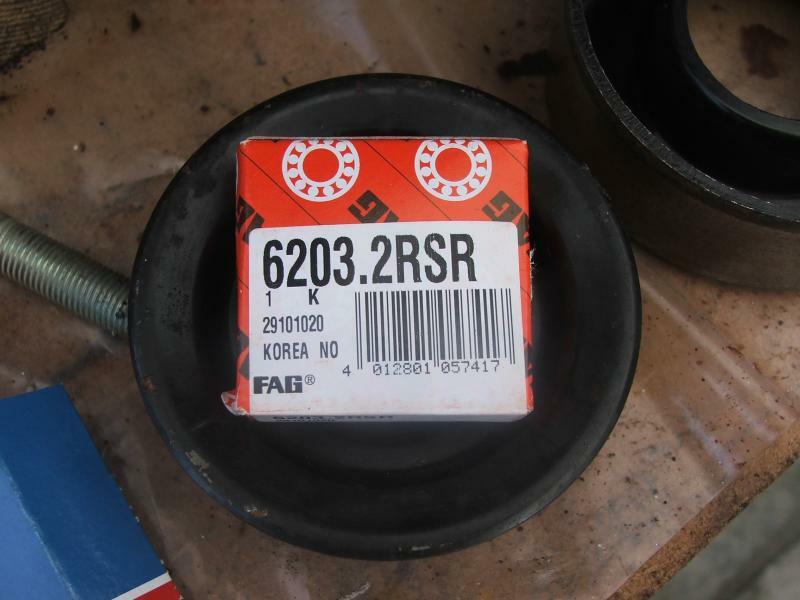 3xFAG 6203.2RSR = 6203 double rubber seal "normal" clearance. It seems to be much more difficult to find "normal" than C3 clearance for the 6203. I think I'll try C3 in my XJR on the basis that C3 is less likely to seize up. I searched for comments about whether or not to use C3 in automotive pulley and tensioner applications. My conclusion is that there wasn't enough consistent information to make a conclusion, but I did find more than a few comments indicating "C3" is used in various automotive drive belt related applications. The slashes, dots, and dashes are random, irrelevant, and interchangeable. Cheapest place to get bearings is almost certainly your local bearing shop. I just got prices from one place here in Dubai, UAE (bearing shops seem to be mostly in Deira for those residents who want to know) and they're equivalent to a quarter or a third of Amazon or other online prices for same brand same size. I wasn't expecting that, I thought they'd be more expensive (usually Amazon and other online is cheaper than anything here). Online places I found which seemed to be more user-friendly than others. www.vxb.com - good range, seem to have own brand and other brands, cheaper prices maybe. US supplier? www.bearing-king.co.uk - good if you're in the UK. Cheaper, easy to use, lots of selection, useful information. Maybe good for continental Europe but a German site probably better then (I didn't look for one). www.bearingsdirect.com - useful for part number cross references, e.g. search for 6203 and find all the different manufacturer suffixes for the same style bearing. www.locateballbearings.com - seems to have a good range. www.amazon.com - better than www.amazon.co.uk or www.amazon.de but if you're in Europe then it's worth trying the latter ones. The first two in that list (VXB and BK) had cheaper prices than the others but still more expensive than I expect you'd find by personally visiting a local bearing shop. Which brand to get? Japanese made, or probably European, Korean (South not North), USA. Trying to rank brand names from those regions doesn't seem to matter so much. As in the lifetime difference might be 90k miles instead of 100k miles. Expect lifetime to be only a fifth or tenth of that if you use Chinese bearings. Don't know about Indian or other bearings. Some brands I was considering: SKF, NSK, NTN, Nachi, ***, Koyo. Possibly Timken but I read several comments that an ownership change meant manufacturing location is sometimes questionable. SKF seems to consistently get positive comments. That's a gut feeling observation not the conclusion of statistical analysis. I'd suggest don't worry so much about the brand. If you want SKF and can find them easily then great, but if not then replace with one of the other more reliable names. Chances are if you're replacing these bearings, and get any of the good quality brands, you are not going to be doing it again on the same car. I'll update this with anything significant after I make the bearing update. Oh yes, why bother with bearings instead of just changing pulleys? 1. There seems to be an update to the pulley system especially on XJR supercharged cars, but I struggled to find exactly the correct pulleys and tensioners I needed. Also it sounds expensive. 2. Cheaper pulleys such as Dayco, Gates, etc might use cheaper Chinese bearings. 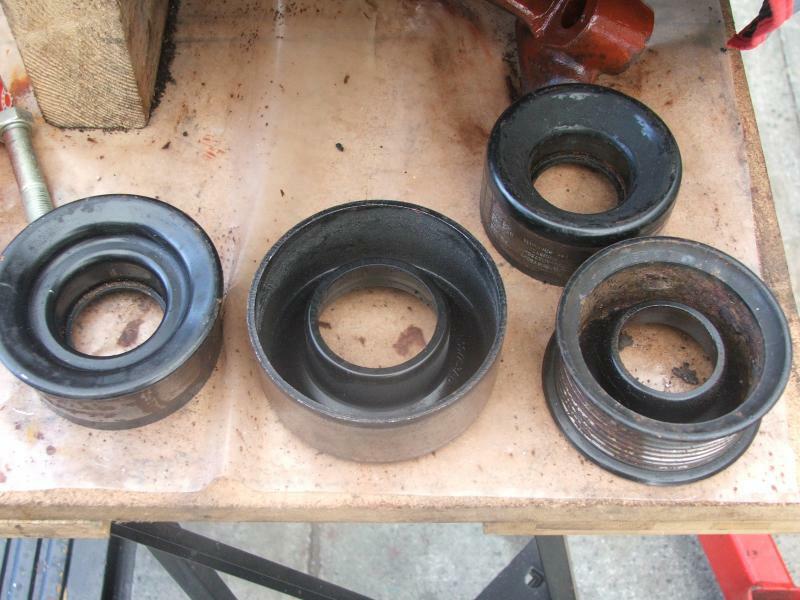 The bearing is the part that wears, breaks, or seizes up and needs replacement. Good bearings mean I doubt I'll have to think about it again. Bad bearings mean I might have to do it again in a few months or a few thousand km. 3. It doesn't sound like that big a job just to replace bearings if you have the right tools. I'd appreciate any feedback especially about my C3 vs normal clearance conclusions. Thanks. Last bit of advice I gathered from various places. Don't use a BFH to install new bearings. Last edited by Auspuff; 04-25-2015 at 05:14 AM. I've ran these bearings in several engines without issue for a number of years. They will do the job fine - the info was to save forum members the time and trouble and added expense of Jaguar's update. Take that as feedback on my original post above - all good here. I hope I didn't come across as contradicting anything you said, it wasn't my intention. Just to offer explanation for anyone in a similar position as myself - not knowing enough about bearings to know what to get if the same part numbers weren't available. Oh, and the *** is for F-A-G branded bearings. Seems to be an auto bad-word filter on that one. Can anyone tell, if I have to loosen the supercharger idler pulley bolt counterclockwise or clockwise? I just ran into a bad bearing noise after cold startup, which lessens when warm. Using a stethoscope, I'm pretty sure it's the s/c idler pulley bearing. When removing the s/c belt and trying to spin the pulley, it will not even spin a whole turn by itself. To be sure, I tried to remove the pulley and didn't succeed when trying to loosen the bolt counterclockwise. But I hadn't the idea trying to loosen it in a clockwise direction at all - just came across this thread a few moments ago. As I slipped off the bolt head a few times and rounded the edges a bit, I won't try again until I know how to loosen the bolt. I used a crowfoot, but next time I'll use a regular socket after removing the fan assembly. Didn't remove it in the first place, as it looked pretty straightforward to me. And: By any chance, does anybody know where to get a new bolt, in case I have to drill out the old one? By the way, I got the one-side-ribbed s/c belt system with a metal idler pulley. Thanks very much for any information! I just went into the garage and grabbed a supercharger belt tensioner assembly I had pulled off my parts car last week and put on the shelf as a spare. I removed the pulley and it is in fact NOT clockwise to loosen. I removed the bolt turning CCW (left) like any normal bolt and it came right off. Your question made me curious and I remembered I had the extra tensioner in the garage. P.S. - Just sharing my experience, if your tensioner is somehow different than mine (year model variations/country variations?) then I can't speak to that. Mine is the original metal pulley with a belt smooth on one side and ribbed on the other from a 2003 XJR. Last edited by harvest14; 04-23-2017 at 03:43 PM. I also had an extra accessory belt tensioner assembly on the shelf. I removed the pulley from that one and it IS backwards from a normal bolt. Clockwise loosened and removed it. 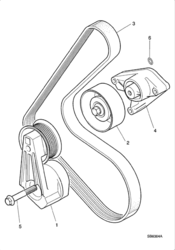 So in conclusion: on my 2003 XJR the accessory belt tensioner pulley is reverse threaded (right hand thread? )...not sure the nomenclature but suffice it to say "backwards as compared to normal bolts". The supercharger tensioner pulley is NOT backwards but removes like a normal bolt. The bearings that I pressed out of each pulley appear identical. I went ahead and ordered the four bearings that Sean B up above recommended (almost 6 years ago, haha). When they arrive I will press them into the four pulleys off my parts car and then when I get a chance I'll switch them out with the pulleys on my 2002 XJR. When I wrecked the 2003 XJR I had no suspicion there was anything wrong with the pulley bearings, even with almost 124,000 miles on the car. But just now when I inspected the two I removed; one of them would only turn about 1/2 way around when I tried to spin it, and the other would spin but with an annoying rattle. They were definitely shot and I didn't even know it. That's why I'm ordering the new bearings for my current XJR without even inspecting them. At 99,700 miles I'm just going to go ahead and change them. you're awesome! Thank you very much! Although I'm discouraged a bit now, since I couldn't loosen the bolt in the first place. I'll try with some penetrating oil for the next few days until the new bearings arrive and hope for the best. By any chance, did you see where the small o-ring goes (part 6)? Just checking: We're talking 'bout part no. 2, right? Negative, good call. I misunderstood. I read what you quoted in your post, which was referring to the pulley on the tensioner assembly. I didn't read your comments carefully enough to see that you were referring to the idler pulley, NOT the tensioner pulley. In the JTIS it simply states to remove the bolt and remove the pulley. There is no mention of it being reverse threaded. Last edited by harvest14; 04-23-2017 at 04:41 PM. Oh damn, that's my fault! I overlooked "tensioner" in the quote. I'd highly appreciate if you share your experience when you disassembled the pulley from the bracket (part 4).